If one only looks at Richard Smith's statistics as a player with the Milwaukee Brewers, you would miss the "rest of the story" as broadcaster Paul Harvey used to say. Smith's actual playing time for the Brews was indeed brief. He appeared in only 14 games as a player in 1936 and 1939. Yet few people have made more of an impact on Milwaukee's American Association ball team than this man during his tenure. Richard Paul Smith was born on May 18, 1904 in Brokaw, Wisconsin, a city on the picturesque shores of the Wisconsin River. Richard's ethnic heritage was part Menominee Indian and German/Irish. By his early teens, Smith's family moved to Combined Locks, Wisconsin along the Fox River, just south of Green Bay. The young redhead loved sports, excelling in both baseball and football. "Red" graduated from Kaukauna High School and attended college at nearby Lawrence University in Appleton, Wisconsin. Smith was part of their 1922 football squad who were undefeated that year. Smith continued his college education in South Bend, Indiana, entering the hallowed halls of Notre Dame where he played football under their famed coach, Knute Rockne. The friendships forged at Notre Dame would have a strong influence on his future. Red was part of their 1926 football team which went 9-1 for the season. Red was the catcher and captain of the Notre Dame baseball team. Enjoying baseball and football, Smith would turn professional in both sports in 1927. 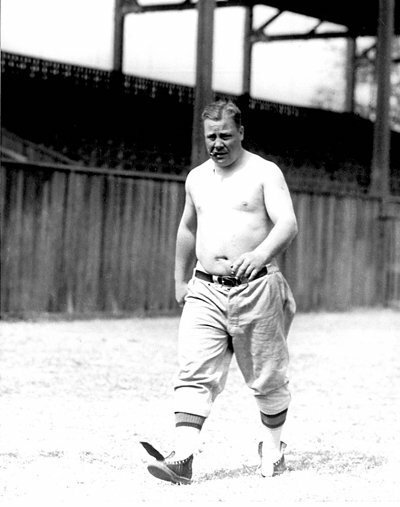 Red returned to Green Bay to play for his "hometown" Green Bay Packers in 1927. 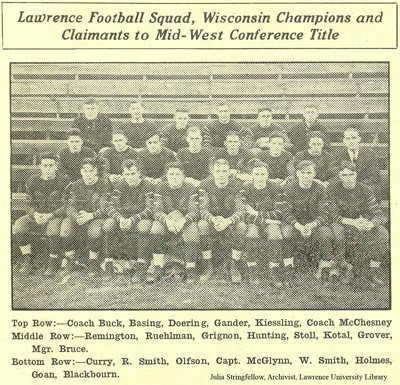 The Packers were coached by fellow Notre Dame alum, Curly Lambeau and would finish the year in 2nd place with a 7-2-1 record. Lambeau did double duty as the team's fullback along with his being its field general. For 1928, Smith would take his cleats east to play for two different New York teams, the New York Giants (4-7-2) and the New York Yankees (4-8-1). He returned to Green Bay for 1929, joining the eventual NFL champions as the Packers went undefeated, finishing 12-0-1. He finished his playing career with the (7-6-1) New York Giants in 1931. While his professional football career was over as a player in 1931, Red would continue on in the sport, coaching at both the college level and in the pros. 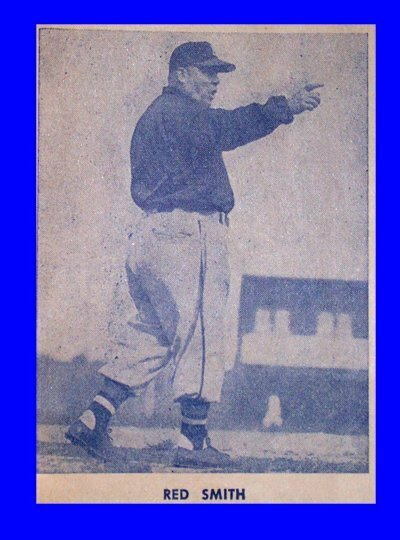 Red coached for Georgetown in 1930 and then moved on to Seton Hall in 1931 where he would become their athletic director, overseeing both the school's baseball and football programs. He would coach at the University of Wisconsin from 1933-1935. 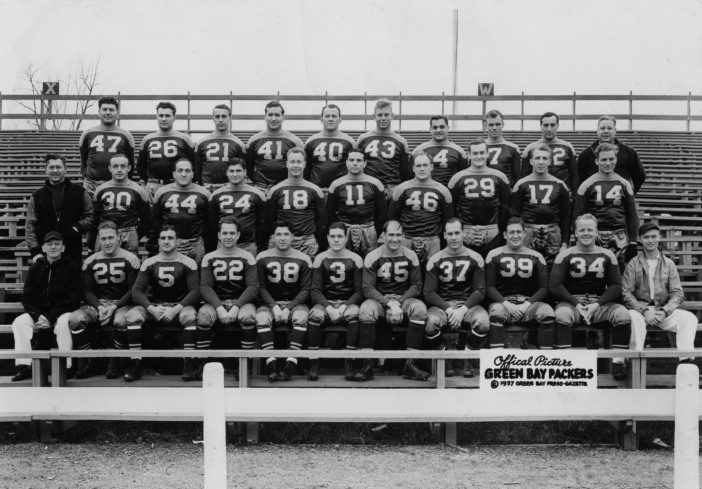 The Green Bay Packers and the New York Giants would use Red as an assistant line coach from 1936-1944. As with football, the 23 year old Smith turned professional as a baseball player in 1927. He joined the International League's (AA) Jersey City Skeeters. While there he played in 22 games and hit for a .205 batting average in 78 at bats. Smith got his shot in the big leagues, playing for the New York Giants managed by the great John McGraw. Unfortunately for Red, his major league career would be but a vapor, playing in only one game. Playing his familiar position at catcher, he scored a put out but didn't get a chance to swing the bat for the Giants. For his next stop, Red joined International League's Montreal Royals in 1928, appearing in 98 games and improving his batting average to .292 in 298 at bats. Defensively Smith performed well, with a .955 fielding average. 1929 found him splitting time between the International League's Reading Keystones(AA) for 21 games and the Eastern League's (A) Providence Grays for 17 games. He hit a combined .234 that season. In 1930 he moved to the Eastern League's Albany Senators where he hit .322 in 36 games with a fielding average of .962. Red's other responsibilities kept him out of playing baseball in 1931. In 1932 Red returned to the International League playing for the Toronto Maple Leafs. He played in 96 games for Toronto, and in 288 at bats, Red hit for a .247 average and fielded a solid .986 behind the plate. Coaching responsibilities in the Badger State took Smith away from playing baseball for the 1933-35 seasons. Red Smith would come to the Milwaukee Brewers in 1936. The Brews had lost both of their starting catchers, Bill Brenzel and George Detore to injuries. Smith was secured to fill that gap until the regulars healed. While his time as a player was short here in Milwaukee, he was popular with the fans hitting a fat .417 average with 10 hits in 24 at bats in his 12 games played. Red filled a needed gap for the Milwaukee Brewers in 1936. 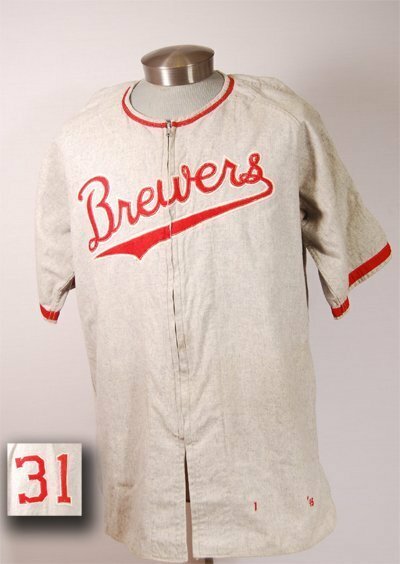 The Milwaukee Brewers would win the American Association crown that year, with a record of 90 wins and 64 losses and would go on to win the Little World Series in 1936. 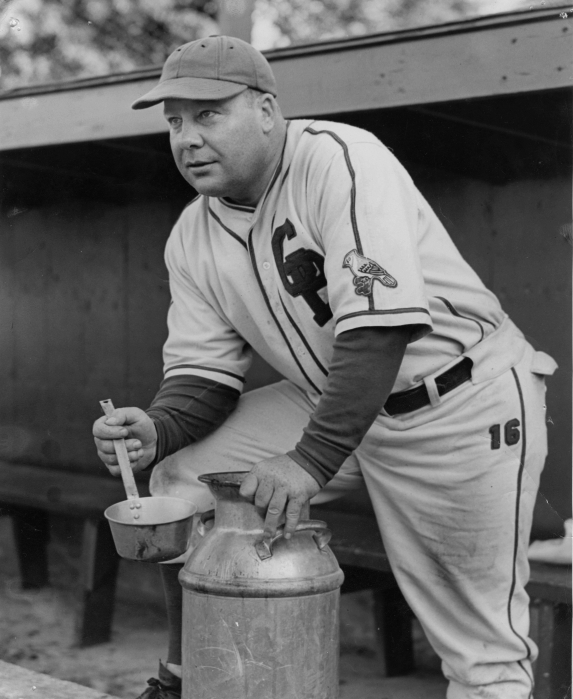 Red's ability to handle players and general knowledge of the game was evident and he would go on to manage several of the Brewers farm teams and of course, continued to play some while skippering these teams. As player with the Fieldale, Virginia Towlers - Bi-State League (D) he scattered 54 hits in 151 at bats for a .358 average. Behind the plate, Red fielded a .975 average in his 45 games played. When the Milwaukee Brewers abandoned Fieldale, Player/ Manager Smith moved on to the Hopkinsville Hoppers of the Kentucky - Illinois - Tennessee League (D) for 1937- 1938. He hit for a solid .281 average over the two years and did a good job as their backstop. He played in 49 games for 1937 and 63 in 1938. Red would return to the Milwaukee Brewers in 1939, but only for a brief 2 games with 2 hits in 5 at bats. His final at bat was reserved for the Green Bay Blue Sox of the Wisconsin State League (D) in 1941. As their manager, he put himself back in 3 games that season, one of them as a pitcher. He batted a perfect 1.00 with a single going 1-1 the season. Smith played for 10 seasons with 398 hits in 1404 at bats with 64 doubles, 8 triples and 10 home runs. He compiled a lifetime minor league batting average of .283. Red Smith's real skill though, was recognized by teams in both football as well as baseball, that of coach and manager. In the dugout, on the field and with the players, Red knew what it was to play the game and had the ability to bring out the best in those around him. "During the year 1930-31, Seton Hall made a radical change in its athletic program. It marked the introduction of inter-collegiate football after twenty-five years in which the Blue and the White of Setonia had not been seen on any gridiron. The man was Richard P. Smith, a former University of Notre Dame player. ...In the person of Mr. Smith, we have an ideal leader. He knows both football and baseball thoroughly, having played while in college and afterwards. He also inspires confidence and love in the men under his system of coaching. He teaches the fundamentals and fine points and adapt's a man's natural style of play to his system of coaching. which goes to make a smooth-working, harmonious machine." This ability of Red to inspire, teach and adapt players skills to benefit the whole of the team was well suited for the Milwaukee Brewers both at the higher levels and in the instructional leagues. Smith would effectively mold many players in the Brewer system and for some, help propel them on to the major leagues. While Smith did a great job filling in for the injured players as a backup catcher, we need to take a closer look at Red, not as a player but in the dugout and in charge of his element. Red was put in charge of the Fieldale, Virginia Towelers replacing Joe Guyon June 5, 1936. With Smith as manager, the team would finish in 3rd place in the Bi-state league. More notable was Red's oversight of a 19 year old Milwaukee native, by the name of Ken Keltner who would join the Brews in 1937. While in Fieldale, Keltner would hit for a whopping .360 batting average with 32 home runs. 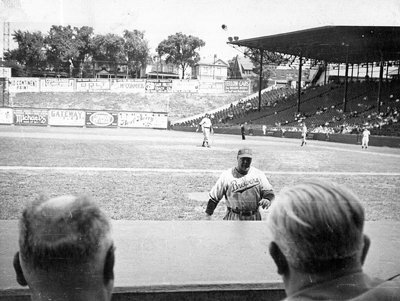 Red accompanied Brewers to spring training for 1937 in Biloxi, Mississippi where he encouraged Brews manager Al Sothoron to try Keltner in the infield. Smith played him in the infield while with the Towelers. He predicted that, "Keltner is destined to develop into a greater hitter than Chet Laabs." Smith, a keen judge of young players, was dead on with his prediction. 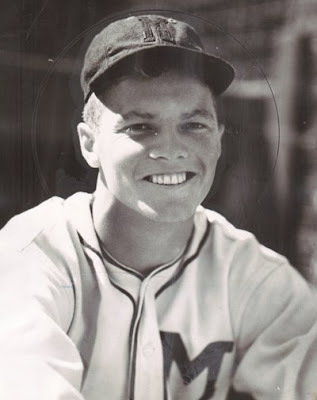 Ken Keltner played exceptionally for Milwaukee in 1937 and would move on to have an equally exceptional career in the major leagues with the Cleveland Indians in 1938. 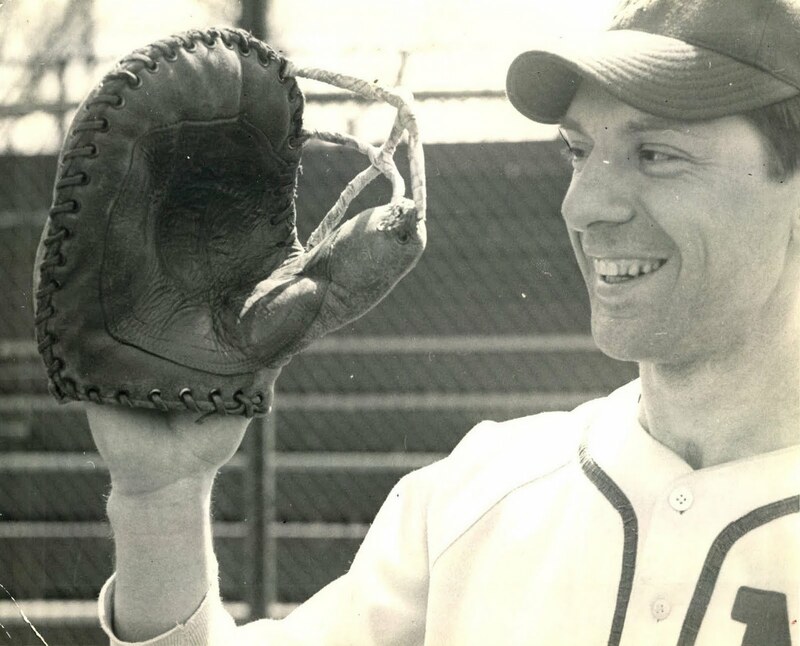 With the Brewers abandoning the Fieldale team, Harry Bendinger hired Red for 1937 and 1938 to manage the Hopkinsville Hoppers. While there Smith would manage many players who would later play for Milwaukee, Stan Galle, Joe Just and slugger Hal Peck to name a few. In 1938, Peck would hit for a .331 batting average with 187 hits in 565 at bats. By May 25, 1938, Smith would be made director of the entire Brewer farm system. 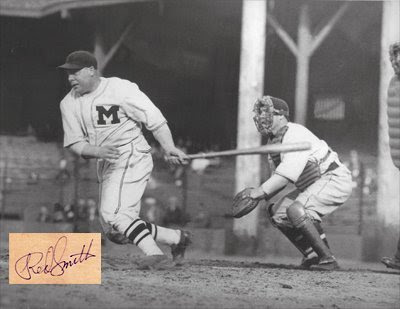 In 1941 and 1942 Smith would manage near his hometown in Green Bay, Wisconsin for the Blue Sox/Bluejays. While there, Red would develop players like Andy Pafko on their 1st place 1941 Blue Sox team. Pafko of course, would go on to a long major league career with the Chicago Cubs, Brooklyn Dodgers and the Milwaukee Braves. 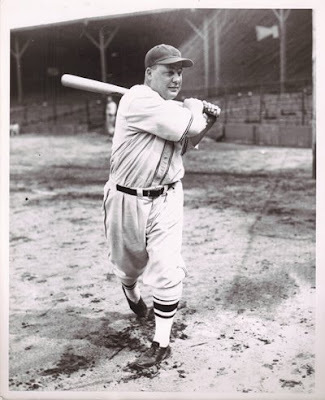 While with Green Bay in 1941, Handy Andy hit for a .349 batting average. 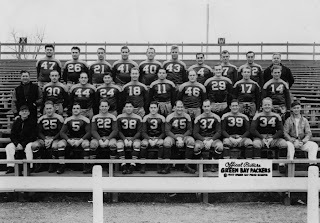 Also on that 1941 Green Bay squad was George "Bingo" Binks. Red Smith gets the credit for changing his swing and turning him into a great hitter. Once he spread out his stance a bit, said Smith, "he became one of the best hitters" for the Blue Sox. In 1942, One of Smith's charges was a young man by the name of Earl Gillespie, who unfortunately wouldn't make it as a ball player. 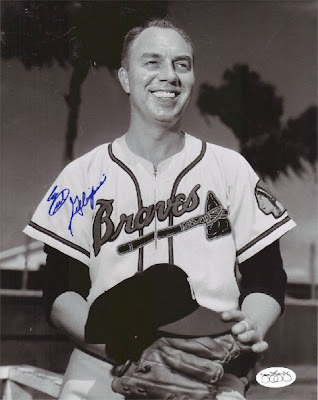 Local Wisconsin sports fans know that Earl would go on to have an enviable career as the play-by-play announcer for the Milwaukee Brewers in 1952 and then become the voice of the Milwaukee Braves from 1953-1965. He would move on to become a trusted sports reporter and Sports director for Milwaukee's WITI-TV 6. Milwaukee would bring Red Smith on as a coach for 1943. Smith, was a perfect fit for the improving Milwaukee Brewers. Along with his baseball expertise, he played his part well in the zany world of Bill Veeck's Brewers. Forgetting the world at war for at least a few hours, Milwaukee fans enjoyed the diversion provided on and off Borchert field. When it came to baseball though, Smith was a very active and able assistant to "Jolly Cholly." His ease at handling pitchers and catchers was only natural for the former backstop. 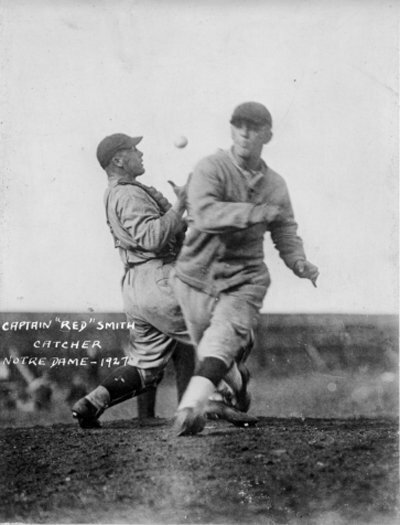 A "rare" view of Red Smith in action during a game with Kansas City, showing Smith wearing the team's road uniform. Milwaukee would go on to win the American Association crown for 1943 with a record of 90 wins and 61 defeats. In 1944 Charlie Grimm would move up to the majors at the helm for the Chicago Cubs, with Grimm, bringing on Casey Stengel to manage Milwaukee in his absence. 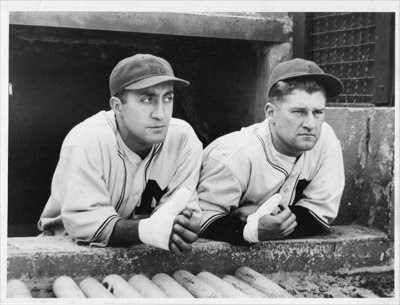 Smith would stay on to assist Stengel for 1944. ... but sad news for Milwaukee was good news for Red Smith, as he would be moving up to the big leagues to coach along side his good friend, Charlie Grimm, with the Chicago Cubs in 1945. 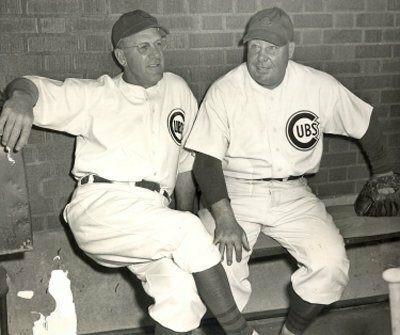 1945 would be a Championship year for the Grimm and Smith led Chicago Cubs. Chicago would win the National League crown with a record of 98 victories vs. 56 losses besting the 2nd place Cardinals by 3 games. They battled the Detroit Tigers in the World Series, losing in 7 games to the American League Champs. 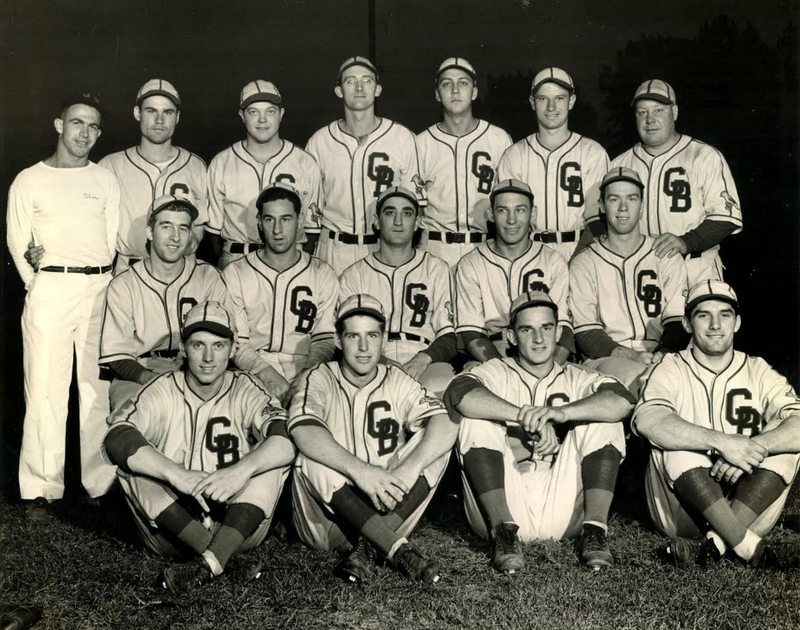 The Cubs would finish the 1946 season with a 82 - 71 record, but with most of the major league players returning from the war, competition was keen and Chicago could only muster a 3rd place finish for the season. This would also finish Charlie Grimm as Cubs manager. Smith would return to Chicago for another 3 seasons, 1947 thru 1949, but the Cubs would plummet to the cellar of the National League. They finished in 6th place in 1947 and in last place for both 1948 and 1949. Charlie Grimm would return as skipper of the Milwaukee Brewers in 1951. "The success-studded combination of Jolly Cholly and Red Smith are back in business at 8th and Chambers and once more all roads lead to the ballpark," proclaimed the Brewers newsletter. Smith's role this trip to Milwaukee was that of the Brews General Manager. Sure enough, as advertised, "Winning ways were back at Borchert Field." It was an exciting season, with the Brewers going all the way, winning the American Association pennant with a record of 94-57. This powerhouse team would go on to win the playoff series and the Little World Series. 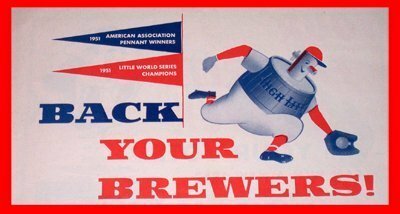 For the 1952 season, the Brewers promised another pitched battle for a 2nd straight American Association crown. The Milwaukee team touted a "typical Smith-Grimm" formula. A combination of returning players and new additions that would emphasize "capable athletes performing as a solid unit, rather than an assortment of individual stars." Charlie Grimm would be called up by Lou Perini to manage the Boston Braves on May 31st... necessitating Red's taking over as interim manager until Bucky Walters would take over June 6th. 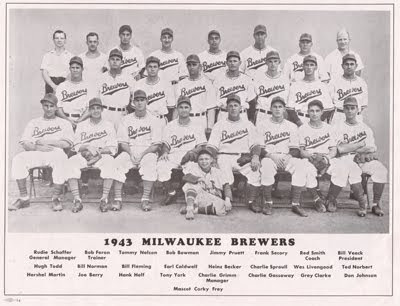 The 1952 edition of the Milwaukee Brewers would better their 1951 predecessors with a season record of 101-53. Unfortunately, the team wouldn't repeat in the playoffs, losing in the final round,4 games to 3 to Kansas City. 1952 turned out to be the final season for the Brewers in Milwaukee as the real plans of Lou Perini were revealed when Charlie Grimm would lead major league baseball to the city. The Boston Braves would become the Milwaukee Braves in 1953. Red Smith would stay on as General Manager with the minor league team that moved on to Toledo. 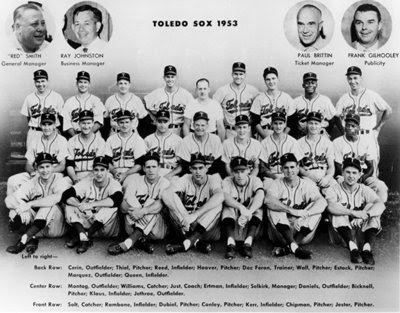 The "Toledo Sox" would win what would have been the Milwaukee Brewers 3rd American Association title in a row in 1953. Red would stay with the Sox until the team left for Wichita, Kansas, becoming the "Wichita Braves" in 1956. Red would remain in Ohio. Smith would work for the Buckeye Brewery in Toledo, eventually becoming their president until its closing in the early 1970's. 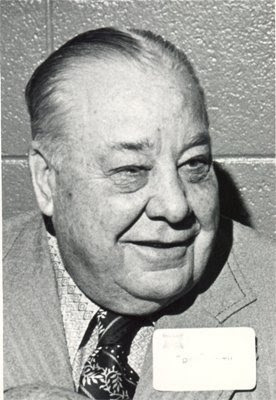 When baseball returned to Toledo (Mud Hens) in 1966, now affiliated with the International League, Red would serve as their general manager and then vice president. Richard Smith would reside in Ohio for the remainder of his life, but would return frequently to his home state, Wisconsin. Red lent his name to an annual award banquet organized in 1965 to raise funds to support local youth sports organizations. It has grown greatly since its inception, including funding a minor league team and presenting local awards and scholarships. Two major awards are given away each year. The Red Smith Award given to a person who has excelled (like Red) in sports from the State of Wisconsin and the "Nice Guy" Award which is presented to a National sports figure. It still continues to this day and has become one of the largest of its kind held in the Midwest. 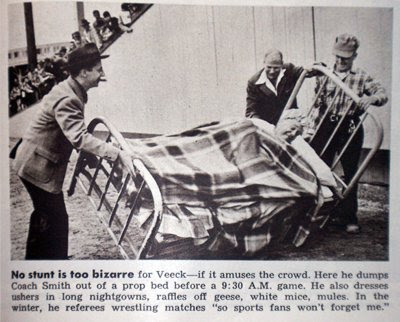 Red Smith was quite comfortable no matter the hat. Playing, coaching football, or swinging the bat. Fullback, lineman, a line coach, catcher, manager or the front office were all easy roles for Red to assume. He did them all because he genuinely loved it all. When he wasn't engaged in playing, managing or coaching sports he enjoyed making sport of the great outdoors that he loved all his life. From early on, Smith was never far from the outdoors he loved. Fishing always had a prominent place in leisure activities, having grown up in central Wisconsin. Beautiful lakes and woods were always nearby and eagerly sought out by Smith. An avid angler, Red was just as skilled with a fly rod as he was with traditional rod and reel. He would tie his own flies. His grandson, fondly remembers going fishing with his "Bompa" hundreds of times. While bass fishing in Florida, Red caught and had mounted a 15lb. large mouth from the Ocklawaha River in 1962, a fish, by the way, that grandson Rick still has. Lake Erie was a favorite fishing spot for walleye and perch for Smith. Most of the fishing trips his grandson recalls were close to Toledo. The Maumee river, Lake Erie, small lakes in southern Michigan and privately stocked ponds. While they would often get lost on the way looking for certain fishin' holes, they ended up fishing somewhere, not necessarily where they intended to fish. Smith adapted to challenges in his avocation the same way he did with his vocation. Smith was also an avid small game hunter, gunning mostly for rabbits and birds. Red had a gun shy Brittany Spaniel named "Chugger" who served him loyally as his bird dog. Red would spend the majority of his time hunting in Michigan, Ohio and his home state of Wisconsin. 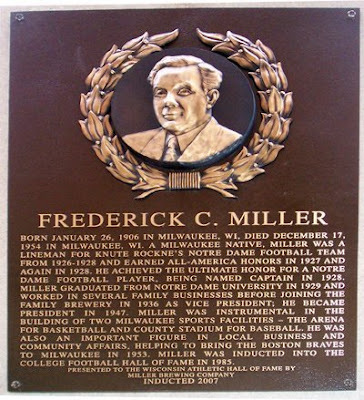 One of his close friends was fellow Notre Dame grad Fred Miller of the Miller Brewing family. Red hunted and fished with Miller often. The Miller's had property in the Upper Peninsula of Michigan and they would hunt and fish together there as well as in Canada on a regular basis. 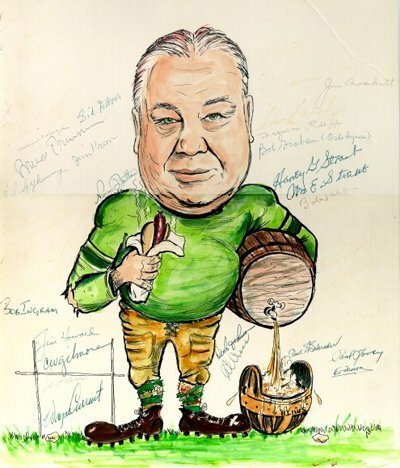 Fred Miller became Miller Brewing's President in 1947 and began his close relationship with Milwaukee sports that would have a profound and lasting effect on the city. He was instrumental in the building of a new ball park, Milwaukee County Stadium, to replace the aging Borchert Field. He saw the value in developing a stronger partnership with brewing and baseball that would benefit both parties. Always the sports fan, he developed close friendships with many ball players, using some to be spokesmen for Miller beer. 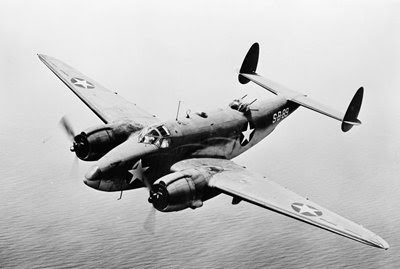 Tragedy would strike the Miller family on December 17, 1954 when the plane carrying Miller, his son and two pilots crashed shortly after take off. In a conversation with Milwaukee Brewers and Braves shortstop Johnny Logan, this author learned that Red Smith was supposed to be on this trip. This was confirmed by Smith's grandson. A fortunate change in plans for Smith avoided this tragedy. Red Smith enjoyed playing cards. 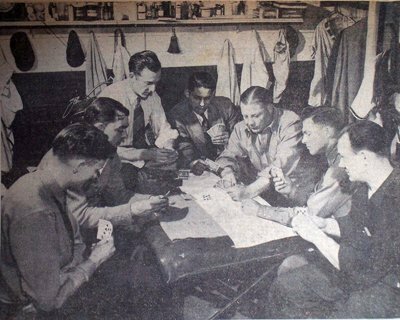 With ball players and friends, there was always time for a competitive game of poker or gin rummy. There was ample down time during baseball season for cards. Sometimes cards would get him into trouble with family. While fishing trips met with her approval, taking the grandson to any of his card games sometimes displeased his daughter. Maybe this is why. An incident worth mentioning gives some insight to Red's concentration and focus when playing cards. While some of the details are lost to time, Red got involved in a card game aboard a ship in New York City. While the boys played on, enjoying their time, slapping cards and bending a few elbows with some refreshments, alcohol was thought to be involved... the ship apparently moved on to its destination without notifying the players. Red and company were oblivious to their next port of call, Bermuda. Red cast a pretty big shadow and was known to take his eating quite seriously. Richard Smith put the same diligence into his eating as he did with sports. By himself he did quite well, but make it a team effort, look out! No one could handle the knife and fork better than Richard Smith and his "Partner in Dine", Charlie Grimm. Wherever this two man swarm of locusts went, they left their mark in empty plates. Their dining habits are legend. Jolly Cholly gave Smith the nickname of "Smorgasbord " when he described his long time friend in his autobiography, "Baseball I Love You." With their return to Milwaukee in 1951, Smorgy and Cholly would again test the mettle of their belts as Brewers. A storeroom near the Borchert Field clubhouse was turned into a kitchen. The Brewers installed a refrigerator, freezer and a hot plate. For lunch they had Polish sausage and sauerkraut. Every Monday, 50 pounds of cold cuts were delivered for them. During the spring time run of walleye in Escanaba, Michigan, they ordered 100 pounds of fillets. They had them fried up on one of the concession stand hot dog griddles. I can only wonder what thoughts those smells invoked in the fans, who had to settle for hot dogs? The waiter brought us each a couple pats of butter and dropped a small stack of black bread on the table. This had disappeared when he came back to take our orders. He announced that among the goodies was a double sirloin. "Ah, said Smorgy, "that's for me!" "Me too, " I said. The waiter suggested we agree on how we wanted it cooked. 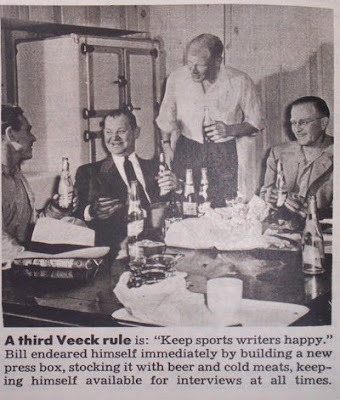 Veeck interrupted. "They each want one." he said. The waiter objected, saying it was for two. "Oh yes sir, real big." "Great" said Smorgy, "Bring a couple. We haven't had anything to eat since noon." Red ordered a plate of cottage fries, too. "You get them with your steak," said the waiter. "Fine," answered Smorgy, or maybe it was me. "Bring the french fries too. And also bring some of that stuff you pile up like logs with the yellow goo over it." When the waiter looked puzzled, Veeck explained, "They mean asparagus and Hollandaise sauce." We ate it all, but not before the waiter had brought in a bowl of butter and a whole loaf of that black bread. Throughout his life, Richard Smith excelled at "being one of the guys." Whether it was as a player, team captain, coach, manager, General Manager, Athletic Director, President etc., Red never lost touch with the camaraderie of being part of the team. Red was known to show up at the University of Toledo baseball and football practices or attend the games, toting along a bag of chewing gum for the guys. With his lifelong love for the great outdoors, he enjoyed it with others. Grandson Rick Johnson has a lifetime of memories of his grandfather to cherish. Thanks Rick for sharing some of them with me. Red Smith joins the ranks of Bill Veeck and his pal, Charlie Grimm, as having a profound effect on Milwaukee's baseball history. Red's hard work helped the Milwaukee Brewers to become one of the best, if not the best team in the American Association from 1936-1952. 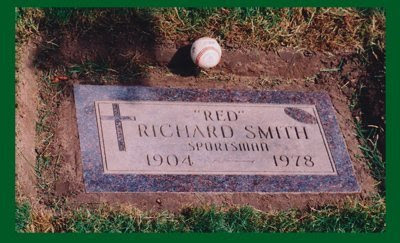 Richard "Red" Smith's final resting place.